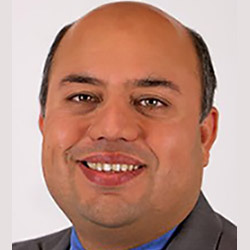 Dr. Shariq Siddiqui serves as the visiting director and assistant professor of the Muslim Philanthropy Initiative at the Indiana University Lilly Family School of Philanthropy. Shariq has a Ph.D. and M.A. in Philanthropic Studies from the Lilly Family School of Philanthropy. He also has a JD from the McKinney School of Law at Indiana University and holds a B.A. in History from the University of Indianapolis. Shariq authors research on Muslim philanthropy and the Muslim nonprofit sector. Most recently, he conducted a national survey of full-time Islamic schools in the United States. This project resulted in the book (that he co-authored) Islamic Education in the United States and the Evolution of Muslim Nonprofit Institutions that will be published in November 2017. Shariq also serves as the co-editor of the new Journal on Muslim Philanthropy and Civil Society and as the Series Editor of the Muslim Philanthropy and Civil Society Book Series published by Indiana University Press. He has served as a nonprofit practitioner for over 20 years for international, national, regional, and local nonprofit organizations. Shariq is also the Executive Director of Association for Research on Nonprofit Organizations and Voluntary Action (ARNOVA). ARNOVA is a leading international association that connects scholars, teachers, and practice leaders in research on nonprofit organizations, voluntary action, philanthropy and civil society. “The Influence of Mosque Attendance on the Probability of Giving and Volunteering.” In Muslim American Life: Reflections and Perspectives, ed. Iqbal Unus (Indianapolis: University of Indianapolis Press, 2014), 45. “Myth vs Reality: Muslim American Philanthropy since 9/11.” In Religion and Philanthropic Organizations: Family, Friend, Foe? ed. Tom Davis: (Indiana University Press, 2013), 203. “Giving in the Way of God: Muslim Philanthropy in the US.” In For The Sake of God, ed. David Smith (Indiana: Indiana University Press, 2010), 28. “Islamic Society of North America. In Encyclopedia of Muslim-American History, ed. Edward E. Curtis IV (New York: Facts on File, Inc., 2010), 449. Curtis, Edward E. IV and Shariq Siddiqui. “Philanthropy.” In Encyclopedia of Muslim-American History, ed. Edward E. Curtis IV (New York: Facts on File, Inc., 2010), 296. “Muslim Charitable Organizations.” In Wisdom of Generosity: A Reader in American Philanthropy, ed. William J. Jackson (Baylor University Press, 2008), 354. “Legislative Issues.” In Giving USA 2006, ed. Melissa S. Brown (Indiana: Indiana University Center on Philanthropy, 2006), 187.
Review of A History of Islam in America: From the New World to the New World Order by Kambiz GhaneaBassiri (Cambridge University Press, 2010). Review of Middle Eastern Studies. Forthcoming. Khan, Sabith and Siddiqui, Shariq. Islamic Education in the United States and the Evolution of Muslim Nonprofit Institutions. Edward Elgar Publishing Inc. October 2017. Siddiqui, Shariq. Understanding Muslim Philanthropy. Under Contract with Indiana University Press, 2018. McNutt, J.G., Justice, J.B., Melitski, M.J, Ahn, M.J., Siddiqui, S, Carter, D.T. & Kline, A. D. (2016). The diffusion of civic technology and open government in the United States. Information Polity (21) 153. Siddiqui, Shariq. “Muslim Philanthropy: Living Beyond a Western Definition.” In Chinese Philanthropy: Past, Present and Future, ed. Caroline Reeves and Gao Xi (Shanghai: Fudan University Press) Forthcoming. Siddiqui, Shariq. “Arab American Philanthropy and the influence of Islam.” In Diversity and Philanthropy: Expanding the Circle of Giving, ed. Lilya Wagner (Santa Barbara: Praeger 2016), 109. Certificate of Teaching for Valuable Teaching Contributions. Labor Studies Program, Indiana University School of Social Work, 2009. Program on Law and State Government Fellowship. Indiana University McKinney School of Law, 2005. “Navigating Identity through Philanthropy During Crisis and Transformation: Legitimacy, Diversity, Power and Innovation in the Islamic Society of North America (ISNA)” at the Association for Research on Nonprofit Organizations and Voluntary Action, November 20–22, 2013, in Hartford, Connecticut. “Impact of 9/11/2001 on Muslim American Philanthropy” at the Association for Research on Nonprofit Organizations and Voluntary Action, November 20–22, 2013, in Hartford, Connecticut. Presented “Philanthropy in Troubled Times: Muslim American Philanthropy After 9/11, at Family, Friend, Foe? The Relationship of Religion and Philanthropy in Religious Philanthropic Organizations at the IUPUI Department of Religious Studies Symposium, October 7, 2010, in Indianapolis, Indiana. Served as a respondent to Reza Aslan talk on “The Future of Islam” at the Butler University Seminar on Religion and World Civilization, September 29, 2010, in Indianapolis, Indiana. Presented “Giving in the Way of God: Muslim Philanthropy in the US” at the Lake Institute on Faith & Giving at Indiana University School of Philanthropy, January 10, 2008, in Indianapolis, Indiana. Presented “Islamic Rules of War—Looking Back to Find the Future” at the Joint Board Meeting of the Common Global Ministries of the Christian Church (Disciples of Christ) and United Church of Christ, April 4, 2008, in Indianapolis, Indiana. Presented “The Influence of Mosque Attendance on the Probability of Giving and Volunteering by Muslim Americans” at the Conference on Islam in America, April 16, 2006, in Chicago, Illinois. Presented “State Government Design and Incentives for Local Codes of Ethics” at Program on Law and State Government Symposium on Integrity in Public Service: Living Up to the Public Trust? September 29, 2005, at Indiana University McKinney School of Law in Indianapolis, Indiana.